A fast and efficient PLC and I/O into a single integrated system. Here is the ideal solution for powerful and compact applications. Use it in combination with local I/O, available with different options or configure with distributed I/O based on CANopen, Modbus TCP or even Modbus RTU. The PLC includes communication stacks for and an I/O editor that let you easily configure your I/O set-up. The HMI keeps its basic communication capability. Even when running the PLC control program the HMI connects to other PLCs and drives and becomes the perfect tool to improve integration in your control system. 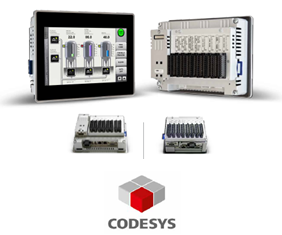 CODESYS version 3 is now the common standard PLC platform for hundreds of controllers in industrial automation and permits, through the use of all the standard languages in IEC programming, an easy and rapid deployment of control applications. The integrated PLC option is available for all eTOP Series 500, Series 600 and eBIS Series 500 products. The optional plug-in modules are compatible with eTOP Series 500, Series 600, and eBIS500. The excellent price/performance ratio will make it the ideal solution for many of your control projects.